These help pages are for the previous version. For updated help pages, click here. Online forms let you collect data from people who visit your website. It could be a Lead Capture form, a Survey, Poll, Event Registration, whatever. There are a bunch of ready-made templates for you to insert into your web pages. Or, if you need any other form for your unique requirement, you can build it from scratch. 1. Click on the Forms tab. 2. 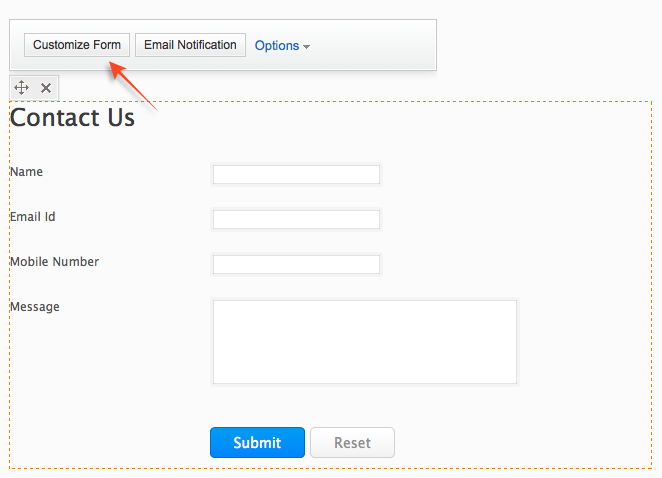 Contact form is added to your site by default. Besides, you have the Forms widget. Drag the Form widget onto your webpage. 3. 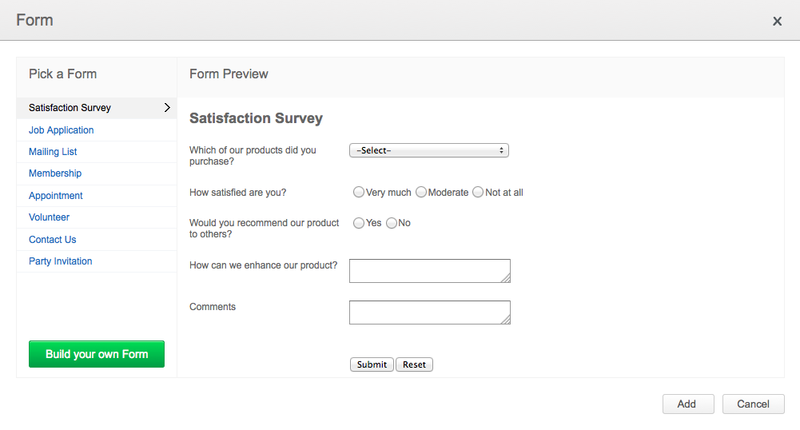 You'll get a dialog box with a list of pre-built forms to choose from, and a button to create your own form. 4. If one of the pre-built forms needs a few edits before it can suit your requirement, add it to your page first, and then click on the "Customize" button to make the edits. Data entered into forms are stored in views. 1. Click on the Manage button. 2. For the data entered into the default contact manager form, select Contact Manager from the list of options. 3. To view the data entered into any other custom form, select Form Data. 4. The View lets you organize and manage your collected data, regardless of the volume. You can search for, filter and sort data for easy access. Forms added to your website can be removed at any time. It involves two phases - Removing the form and deleting it completely. When you remove a form, it no longer shows up on your website. But the form is not deleted, and all the data entered into it still exists on your account. You can insert it into your webpage any time later. To remove it, you only need to delete the element from the site builder. 1. In the site builder, select Form Data on the Dashboard list. 2. On the left, you'll have a list of all the forms you currently have embedded on your site. Click on the form you wish to delete. 3. Click on the "Delete Form" link at the bottom of the screen. You can also have the form data emailed to the email address on the account or any other email addresses. To enable email notification, click on the form, click on 'Email Notification' button, enter the email addresses to which you want the notification emails to be sent to (choose zoho.adminsuerid) from the drop-down menu of To field, if you want the notifications to be sent to the email address on the account) and save the changes. You can also have the form data emailed to the person who submitted the form. In order to do that, choose 'input.userid' from the drop-down menu of the To field and save the changes. Note: There is a limit on the number of records that can be submitted in forms on your website and it is currently set as 2000. If the number of form submissions on your website has reached 2000, and if you want more number of users to be able to submit forms on your website, you will have to export the existing form records into a file and delete the form records from your website builder. 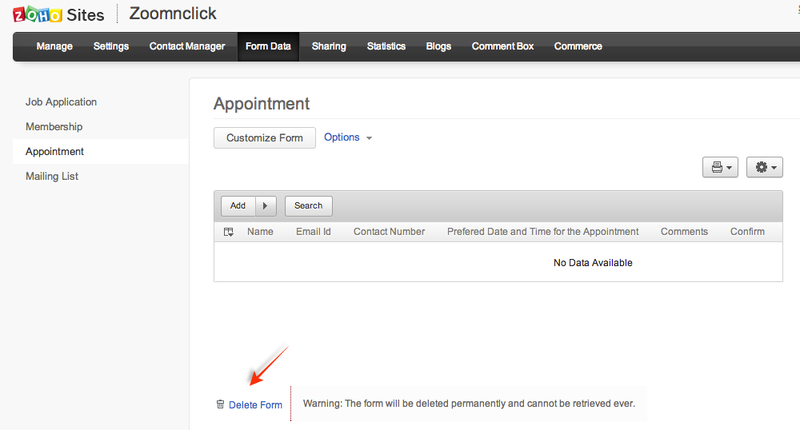 To export form records from the website builder, go to Manage > Form Data. Once you have Form Data page open, click on the name of the form, click on Settings icon, choose Export and select any one of the available file formats. © 2014 Zoho Corporation Pvt. Ltd.